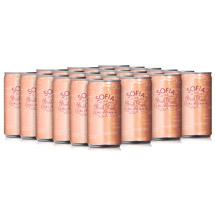 Styled after the sparkling rosés in France, Sofia Brut Rosé offers light effervescence, crisp natural acidity, and a light creamy texture. 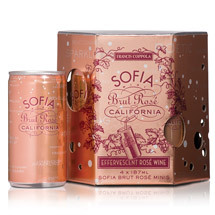 Unlike our still Rosé, which is crafted from Rhone varietals, Sofia Brut Rosé is made from a blend of Pinot Noir and Chardonnay, which offers alluring, aromatic flavors that pair well with assorted cheeses and charcuterie, hors d’oeuvres, shellfish, and spicy Asian cuisine. 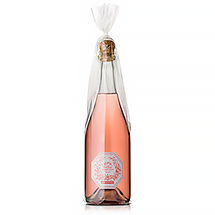 The French Cremant sparkling wines, which our Brut Rosé is styled after, have a light pink salmon hue from skin contact with the red fruit. For our selections we look for grapes that deliver clean, refreshing flavors and a light, elegant body. To keep the alcohol content low, the fruit is harvested at a lower brix in the early morning hours and immediately pressed into stainless steel tanks. Effervescence is created using the Charmat method, which produces frothy bubbles and a lightly creamy texture. There are scents of white floral with a touch of spice and kumquat. Flavors of freshly picked strawberries, cherries, and red currants. 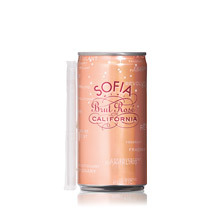 The finish is light and uplifting with a graceful palate, this wine brings flavors to life on a long, sparkling finish. Makes a fantastic aperitif and is perfect for sipping poolside.